The Wahama Rho Kappa Social Studies Honor Society has completed a nearly 39-minute video titled, “History of Mason County.” A total of 23 clips on historical people, places and events are on the video, and cover from the days of the Native American Indians to the Silver Bridge and Farm Museum. 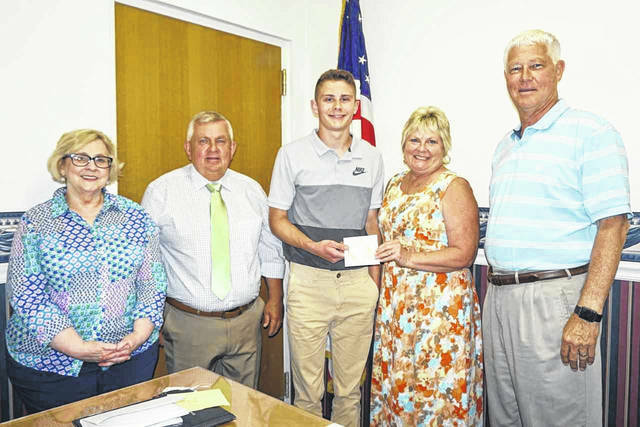 Copies of the video were recently presented to members of the Mason County Commission. Pictured, from left, are Catherine Hamm, teacher and Rho Kappa advisor; Commissioner Sam Nibert; Rho Kappa President Isaiah Pauley; Commissioner Tracy Doolittle; and Commissioner Rick Handley. MASON — Members of the Wahama Rho Kappa Social Studies Honor Society left a legacy at the end of the school year that will not only benefit students, but the public as well. “History of Mason County,” a nearly 39-minute video was created by the 22 society members. It is available for the public to watch on YouTube, and features historical people, places and events throughout the county. According to Rho Kappa President Isaiah Pauley, the video covers the time period of the Native American Indians to the Silver Bridge and West Virginia State Farm Museum. He said some of the more known items are the Battle of Point Pleasant, Lakin State Hospital, and Lowe Hotel, but there are also more obscure topics, such as the Hartford Salt Mines, Roseberry House, and General John McCausland. Students had no access to professional equipment, and videoed on cell phones. The clips were then edited and put together by Pauley on a home computer. What the video lacks in quality, however, it makes up for in accuracy. Pauley said the video was scrutinized by both teacher and advisor Catherine Hamm, as well as local Historian Chris Rizer, who recently graduated from Shepherd University, having studied historic preservation. Pauley and Mrs. Hamm presented copies of the video to Mason County Commissioners Tracy Doolittle, Sam Nibert and Rick Handley. Commissioner Handley encouraged the society to share the video with other schools throughout the county as a teaching tool. Rho Kappa members who completed clips on the video were seniors Colton Arrington, Anthony Ortiz, Baylee Hoffman, Bryton Grate, Courtney Rickard, Destiny Sayre, Kenzie Warth, Kerigan Blake, Lauren Fields, Madison VanMeter, Megan Roush and Isaiah Pauley. Underclassmen participating were Aubrey Johnson, Brandon Duncan, Camryn Tyree, Hannah Billups, Jacob Lloyd, Kaitlyn Greene, Kyrsten Baker, Lexi Layne, Maddy VanMatre, and Sydnee Whaley.